These ACCEL copper spark plugs fit Harley Davidson Evolution with .040" gap. 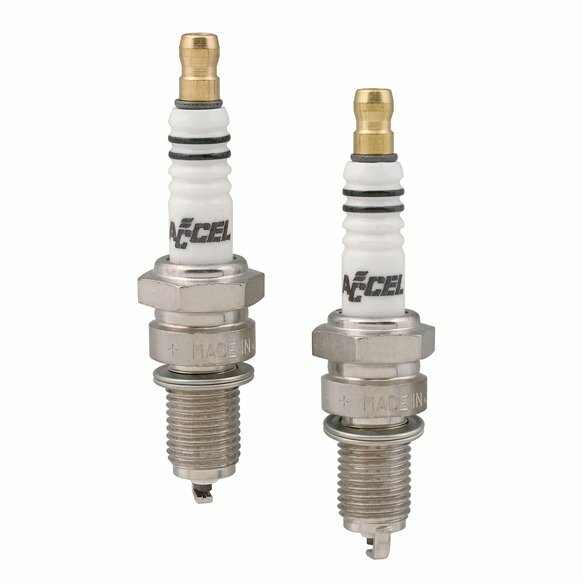 ACCEL U-Groove performance spark plugs have a patented U-shaped ground electrode that produces a double wide, hotter spark to ignite standard or even the highest compression engines. The sintered alumina heavy-duty five rib insulator eliminates flashover and overheating that occurs with high performance and long range applications. ACCEL U-Groove spark plugs use the purest copper/nickel alloy electrode to produce a broad heat range that is highly foul resistant and dissipates heat better than any other material. Years of racing and street performance research has proven that ACCEL U-Groove spark plugs deliver the hottest spark and the highest performance of any spark plug available.